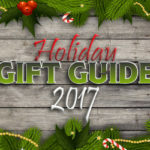 Last year I told you about Feudum board game and the immense amount of time and effort it took to get a grasp of the game. The main reason is because it’s a big box with a lot going on. I said that games rich in details such as that could benefit from a walkthrough using the Dized app. In my opinion, the app was best used for games that would take a long time to learn without the digital walk-through. Never have I struggled so much with a small box game that I wished it had a Dized tutorial. 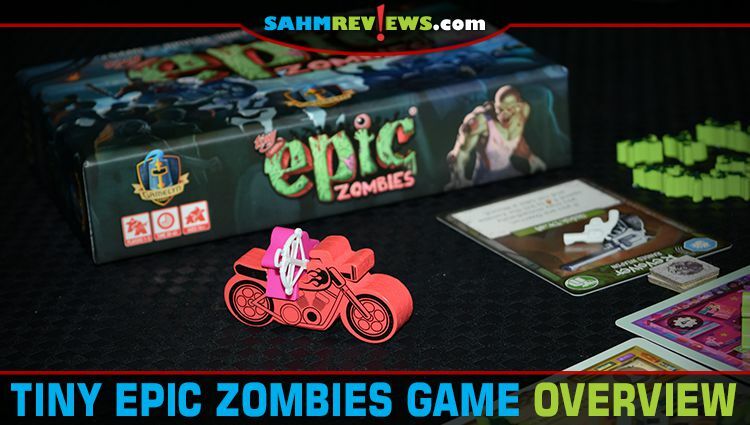 But I have to admit that I met my match recently with Tiny Epic Zombies from Gamelyn Games. I opened the tiny box and pulled out the instructions. 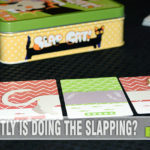 “It’s a tiny game.” I said to myself, “How difficult could it be?” That phrase about judging a book by its cover also applies to board games. Apparently. Because I couldn’t be more off-base with the complexity in this tiny box! The amount of value in this 7″ x 4.5″ x 1.5″ box (see, it literally IS tiny) was a complete shock. 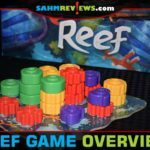 The game play is very similar to other zombie games we’ve played, but it’s the setup and components that help this game stand apart from others. I’ll touch on how to play, but since the setup is what threw me the most, I’m mostly going to focus on that. To start, you’ll place the courtyard in the center of the table. Then you’ll randomly place the double-sided mall cards around the courtyard. Setup varies based on which cards you select. As an example, there’s a parking ramp and a security office. Depending which side is up is whether you’ll use the motorcycle or the police car. 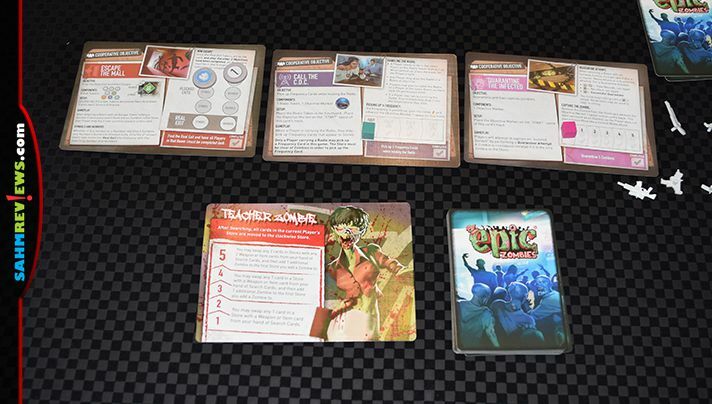 The box includes 9 double-sided objective cards. Which side you use depends on whether you want to play a cooperative or competitive game. 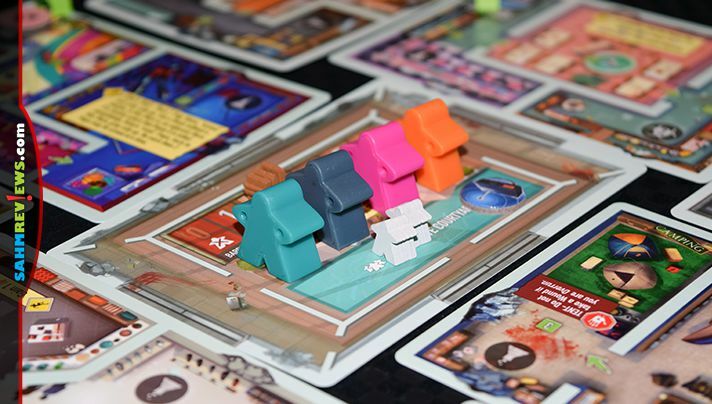 The game adds even more depth by letting you select from Cooperative vs Zombie, Cooperative, Competitive vs Zombie, Competitive or Solo. You’ll set up the game by starting with the tokens referenced on the three objective cards you randomly selected. There are 29 objective tokens… you won’t use them all in one game. Take all the stuff you won’t be using and put it back in the box so it doesn’t confuse you. Players are randomly given a player card which depicts a player on one side and a zombie on the other. The side you’re using is determined by the mode you’ve selected. In Cooperative, you’re playing as a team against an AI zombie. Competitive has you playing against each other. 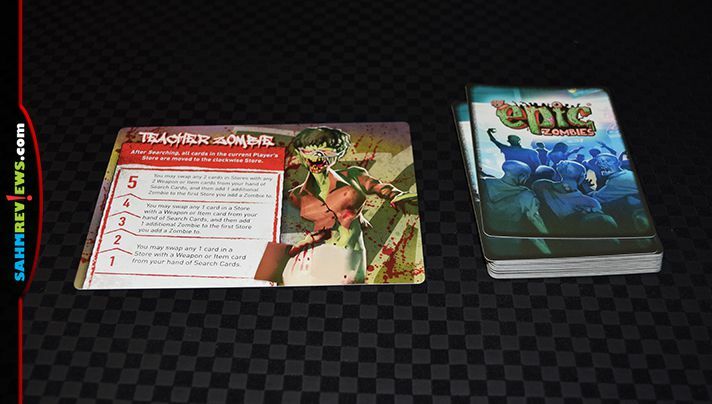 If you’re playing a Cooperative vs Zombie mode then one player is selected to be the zombie and takes a zombie card. All other players play the human side of the card. On the top of each card is a tracker for health and ammo. As you get hurt, the health marker raises. As you use ammo, the bullet lowers. There are ways to raise and lower these to improve your status, but if they ever cross over each other then you’re considered too weak to defend yourself and that’s not good. A number of steps take place when this happens and it pretty much means you’ll be taking on the life of someone new while your old self becomes a zombie. In addition, each character card has spots to hold two weapons that you’ve collected. You place them at the bottom of your player card to identify what those abilities are. You’re able to hold one hand-to-hand weapon as well as one ranged weapon. When I said there’s a lot in this little box, I meant it. 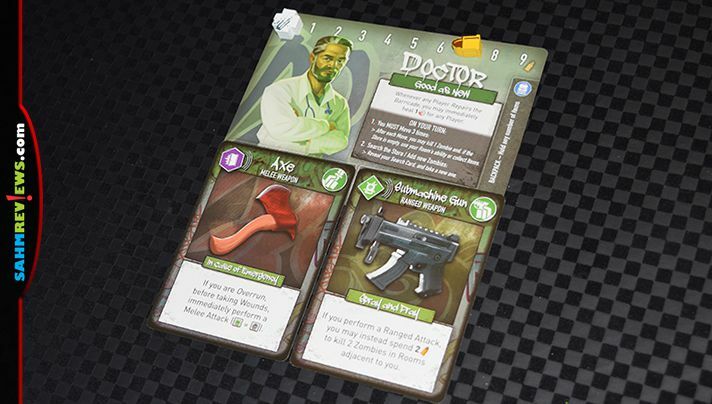 Rather than simply referencing your player card for your abilities, you and your teammates (or opponents) are able to visually see what you have because your meeple is holding them! 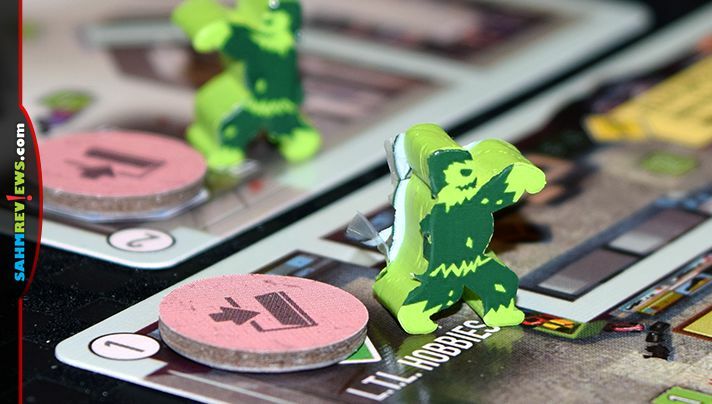 The goal of the game is to meet your objectives before the zombies meet theirs. On your turn, you must move three times. 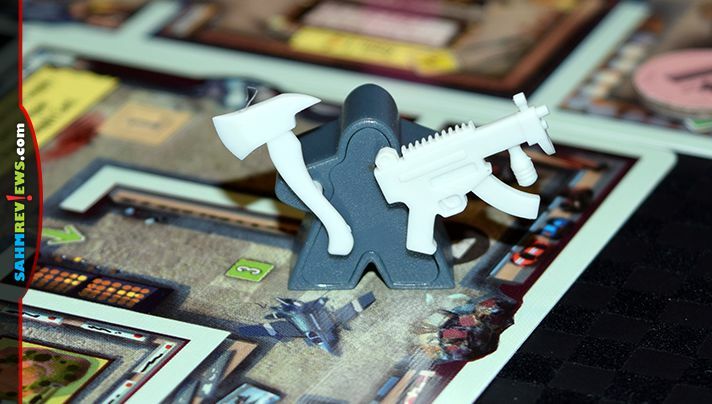 You can do any or all of the following during your turn: Kill a zombie, use a room’s ability and/or interact with tokens in the room and collect items. Each time you engage a zombie, it will die. The difference is if it’s a melee combat, you need to roll the die to find out if you take a wound or not. You’re always able to use a bullet (on your health track) to shoot and kill a zombie one room over, but it makes you weaker. At the end of your three moves and their corresponding actions, you search the store. This is the trigger to determine if you make noise and the zombies hear you or if you’re quiet and can sneak around. This process is done using a deck of cards that are seeded with events and weapons. This triggers the zombie turn. If the player was quiet, 2 new zombies are added to the stores that match the icon on the card. If the player made noise then FOUR zombies are added! Since this step happens after each player, things get crazy rather quickly. You’ll be rushing around the mall trying to stay alive, collect items, kill zombies and ultimately complete your objectives. Like most zombie games, it’s an ongoing battle to keep from becoming a zombie. 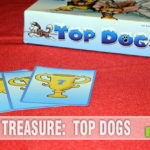 The variety of game modes, in addition to the double-sided location cards and multiple objective options, ensure that this tiny game has a lot of room for replay. At under $23, that’s some incredible value. 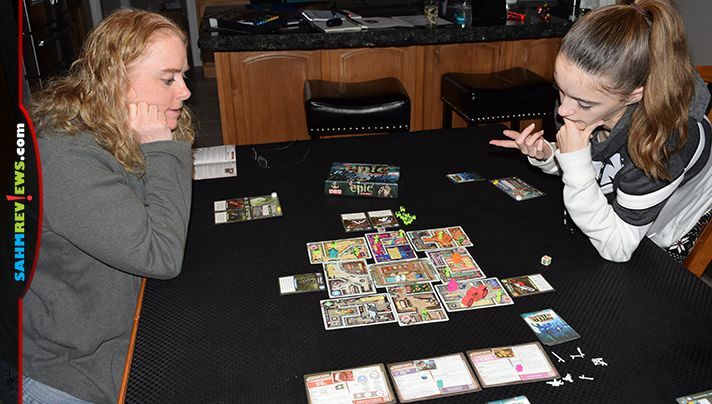 If you’re ready to clear the mall of the zombie infestation, then pick up a copy on Amazon or direct from Gamelyn Games. If you want to learn about their other “Tiny” titles and see what else they’re cramming into boxes, then follow along with them on Facebook and Twitter. 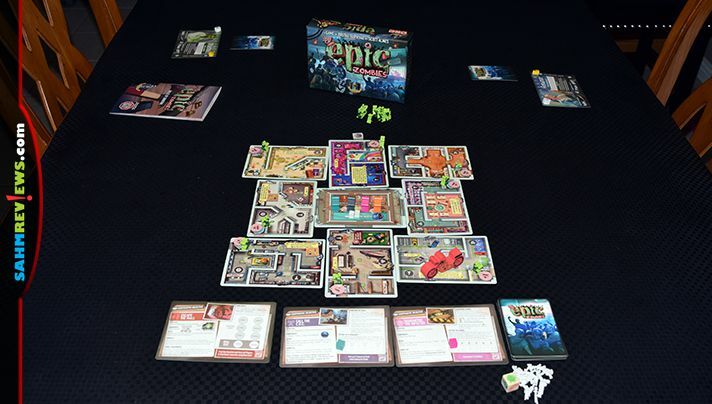 We still have a few days left on our giveaway to win a copy of Tiny Epic Zombies so be sure to pop over and enter it! What part of the mall would you hide in if it was invaded by zombies? They did put a lot into their Tiny box. Could be fun.